uTorrent is perhaps the most used Torrents client. It was released in 2005 and I myself have been using it since 2007. Over the course of the project, the uTorrent team has made excellent improvements to their product. Thanks to them we can now use uTorrent to prioritize torrents and even the files within them. The client has a ton of other cool features would take more than a blog post to cover. The apps can be added to uTorrent from within the client and take just a click to install. uTorrent users could see which addon would give them the preferred user experience without compromising the fast response time and downloading speeds of the client. 1. 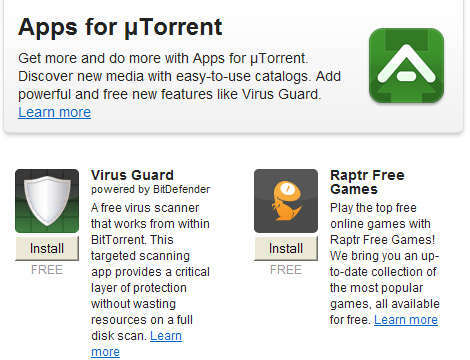 A free virus scanner for BitTorrent downloads. 2. µGadget which allows users to monitor and control torrent downloads more easily from a browser. 3. VODO, the BitTorrent powered distribution platform for filmmakers, also has an App. The version of uTorrent that supports Apps is codenamed ‘Griffin’ and can be gotten from their ‘Labs’ page here.